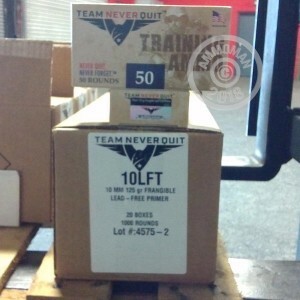 If you're doing close quarters training or steel target shooting with your 10mm Auto pistol, you'll want to get your hands on a few of these 50-round boxes of ammo from Team Never Quit. These rounds fire a 125 grain frangible Sinterfire bullet at a muzzle velocity of 1,450 feet per second. Upon striking hard surfaces, Sinterfire bullets break apart into tiny fragments of tin and copper instead of ricocheting as other bullets often do. In addition to this key safety benefit, these rounds are lead-free (including non-toxic, non-corrosive primers) and ideal for indoor shooting. TNQ frangible ammunition is the product of a joint development team including Sinterfire, PNW Arms, Snake River Shooting Products, and former Navy SEAL Marcus Luttrell.